Contrary to C++ and Java, Scala does not allow developer to exit an iterative execution prematurely using a syntax equivalent to break. However these methods are not available outside collections. There are cases where a `break` construct may be a simpler solution. This post review the different options to 'break' from a loop according to a predefined condition. Although breaking out of a loop may not be appealing to "pure" functional developer, the Scala language provides former Java and C++ developer with the option to use break and continue statements. The breakable statement define the scope for which break is valid. Luckily, Scala provides collections with functional traversal patterns that can be used and chained to break, elegantly from a loop. The following code snippets introduce applies some of those traversal patterns to an array and a associative map to illustrate the overall "functional" approach to iteration. Let's consider the problem of extracting the elements of an array or map before a predefined condition is met for an element. For instance, let's extract the elements of an array or a hash map until one element has the value 0. 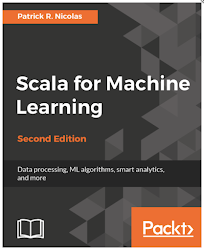 The Scala programming language provide us with the takeWhile method (lines 7 & 10) that allows to to end traversing a collection and return a elements of the collection visited when a condition is met. The second case consists in accumulating values until a condition on the accumulator is met. Contrary to fold and reduce methods which apply a function (i.e summation) to all the elements of a collection to return a single value, scan, scanLeft and scanRight methods return a collection of values processed by the function. In the following example, the invocation of the higher order method scanLeft (lines 4 generates an array and a hash map with the cumulative values. The takeWhile method i(lines 5 & 8) s then applied to the resulting array or map to return a collection of cumulative values until the accumulator exceeds 56. The same invocation can be used to return the element which push the accumulator beyond the threshold. A third and elegant alternative to exit from a loop is using the tail recursion which is supported natively in the Scala language. The first method, findValue exits the loop when a condition on the value is reached (line 5). The second method, findCummulative, is implemented as a closure and exits when the sum of elements exceeds a predefined value (line 15). You’ve trimmed my dim. I feel as bright and fresh as your prolific website and blogs! I have 1 or 2 arrays to call in a config file in a sheet called Array. Is there a way to call and assign these arrays from the object? I want to pull this Array1 from the config sheet “Array” and use this Array of String in a options property in an Input Dialogue activity. How do I do this? Is JArray a variable? What type if it is? Use the Automation Anywhere Object Recorder to manage and execute Windows controls as a background process. The “scroll” option in SendHotkey activity simulates pressing the “Scroll lock” button on the keyboard. Enable or disable this option is best seen within an Excel sheet: when enabled, if you press any of the arrow keys it will result in the screen moving in that direction, but the selected cell will not change. It has nothing to do with the actual scrolling. In my opinion, the best way to scroll whitin a list or page is with SendHotkey -> arrow up/down OR pg up/down. Aws online training in india – Webtrackker is the best AWS stands for Amazon Web Services, the name given to the cloud computing facilities of the Amazon group. It has a comprehensive training program based on solutions that should be known to those who aspire to develop their skills in cloud computing. Applicants can receive a high quality AWS training experience from experts from reputable training institutes. Many different skills are taught to applicants in AWS. Candidates are exposed to the main functionalities of the main Webtrackker is the best AWS services in India, key concepts, applications, security and architectural patterns. Webtrackker Indirapuram offers an inclusive software testing training in Indirapuram. The extensive practical training provided by the Software Testing training institute in Indirapuram, equips live projects and simulations. Somebody could share the way how possible (or how it uses) to do the automation testing of a mobile app in combination: windows PC + iOS mobile phone. Many automation software platforms support only the combination - MAC pc + iOS phone. PS: if similar text exist more than one time on the screen then make use occurrence property of click text to find specific text .